This is making use of AstroArt’s processing system, but there are other methods of processing colour camera work, though I find AA to be as good or better than others. 1. Open all the frames acquired of the picture in question. Look them over and discard those with blemishes, trailing, excess noise, satellite tracks etc. 2. Open the best of the frames and click Colour/CCD Colour Synthesis and you’ll get the first dialogue box above. Now set your Offset by changing the numbers in the boxes on the right so the patterns of squares match as closely as possible those on the left, You have choices of 0/1; 1/1; 1/0; 0/0. In my case, an M25C it’s best matched by 1/0 as you can see in the picture. Prove it out by clicking OK. If the resulting colour version of the frame looks good, keep that setting, but discard the coloured frame and close all images on screen. 3. Open Tools/Preprocessing, and the second picture above is screened. 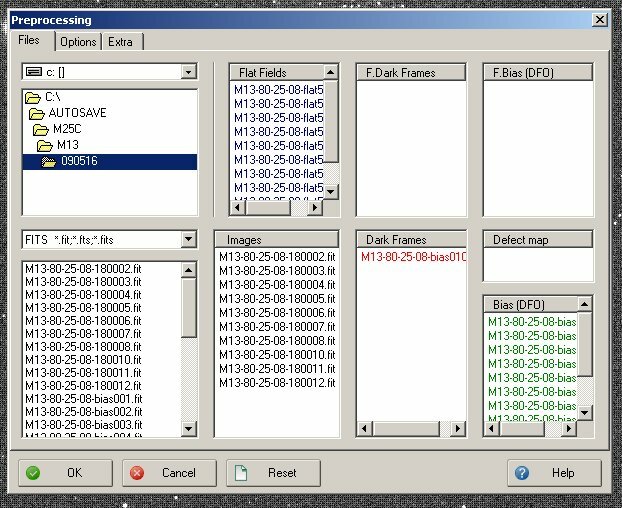 Click Files and make sure the relevant directory is listed in the top left pane and the files are in the bottom left pane, and click Reset to clear the working panels. Highlight all the light files in the bottom left panel and drag them into the Images panel. Highlight your flat frames and drag them into the Flat Frames panel, all your Bias frames into the Bias Frames panel and your Darks into the Dark Frames panel. But as my camera doesn’t need Darks I use one of the Bias frames as a Dark, if I use Bias frames at all, which is seldom. Click Options, at the top to set your parameters, and the third picture above is screened. 4. In Images, choose the method of stacking. 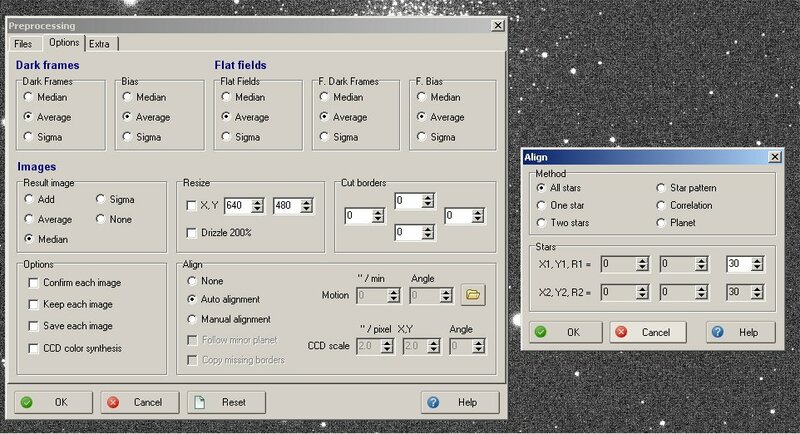 I use Median for stars, open clusters, globulars etc., as it averages, and helps preserve star colours, and also deals well with hot pixels. I use Add if I need to enhance nebulosities more. In Align, click Auto, then All Stars, then OK, to return to the Options page. 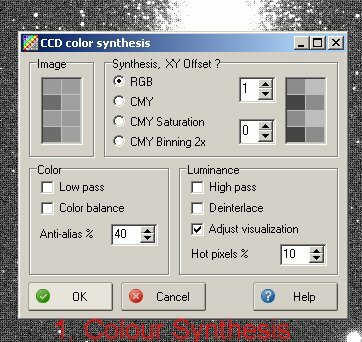 Click the CCD Colour Synthesis box, bottom left. There are other parameters but ignore them for now. Click OK, and AA will stack and calibrate the files. If not well stacked, try other parameters in the Align, and finally try Manual. If successfully done, you should now have the file on your screen ready for processing. This is a single colour file and should be well colour interpretted. Save it as a Fit file, then I usually save it again as a Tiff file and take it into Photoshop for further work.